Hillsboro, Ore. – As of October 1st, you can no longer hold a cell phone or other electronic device while driving. The new law makes it illegal to touch your phone while you’re at the wheel. 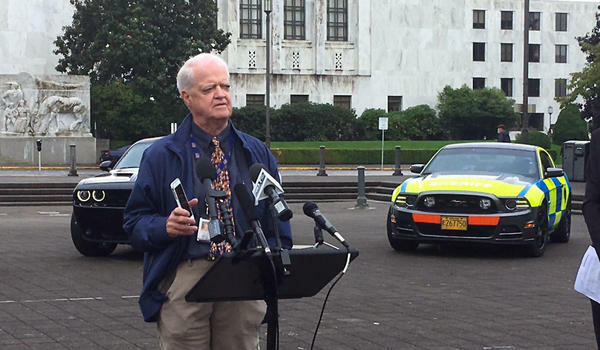 This law clarifies Oregon’s hands-free driving regulations. Beginning October first it will be illegal to hold any electronic device while driving–that includes phones tablets and GPS. The change makes it easier for officers to enforce the law–but doesn’t stop you from using the phone completely. What Can You Do While Driving? You can use a single swipe to turn a function of the device on or off, and you can still use hands-free accessories that give input to the device. If you must talk on a phone while driving, find a good hands-free system with voice controls. Learn to use it before you start driving to minimize distractions on the road. Program destinations into your GPS before you start driving. If you’re shopping for a new GPS unit, find one that uses voice commands. Using an electronic device while driving for any reason – even hands-free – is not allowed for people under age 18. Remember that the intent of the law is to help make our roads safer and to potentially save lives. A first-time offense that doesn’t contribute to a crash has an automatic fine of $260. However, that amount can go up or down if you don’t pay. The minimum fine if you contest is $130, the maximum is $1,000. For a second offense, or if your first offense contributed to a crash, it’s a Class A violation, with a presumptive fine of $435. The minimum fine could be as low as $220, or as high as $2,500. A third offense within ten years of the first two is a Class B misdemeanor, with a minimum fine of $2,000 and a maximum fine of $6,250. In addition, you could be sentenced to one year in jail. Driving citations (like traffic tickets) can affect your insurance premiums. Make sure you follow the law and avoid distractions when driving to stay safe, avoid accidents, and to make sure you are eligible to get the cheapest insurance in Oregon.